Since the burst of holiday color has faded now and the drab grays of winter have set in in my part of the world, I am always looking for a brighter color or two in my wardrobe. Of course a sweater is the best way to go. It provides warmth and color at the same time. 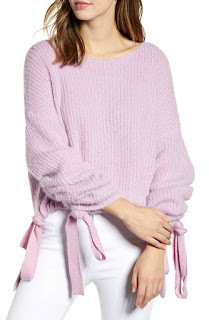 This morning, as I was listening to the weather forecast calling for the first sizable snow of the winter, I found this sweater on "Fabulous After 40" which brightened my day. You can see several more by following the link. I hope they brighten your day too! While you are bracing yourself for a snow storm, I am lucky enough to have some actual sunshine and moderate temperatures in the forecast here in Seattle - No rain until the middle of next week! It prompted me, yesterday, to take a look in my closet at those items I rarely wear. I played "dress-up" for a while before deciding to wear a black jean pencil skirt that is different in that it is very high-waisted, hemmed below the knee, but with a slit in the front that extends modestly up the thigh. I wore black tights underneath (in keeping with the season), and a sort-of cropped jacket over a cami on the top. What shoes to wear was a problem because of the different lengths I was wearing, and I decided that heels would be best. I dug out a pair of some old standbys that I hadn't worn in years, but still love despite the fact that they are 5" platform wedges that a woman of my age might shy away from. Still, they are very nice leather Steve Madden's, and I can walk just fine in them (especially having to take the shorter strides necessary while wearing a pencil skirt. OK, I'll admit that this outfit might have been something from my cross dressing wardrobe of old, but I felt quite confident in my presentation as the woman I am. The 5" heels put me at six-feet, two-inches, but my overall look was proportional, and I don't really feel self-conscious about my height anymore. Needing to do a little grocery shopping, I thought about ending my dress-up fun, and to change into my regular jeans-look. Seeing the sun shining outside my window, though, I was reminded what had prompted me to choose the outfit in the first place. So, off I went to the grocery store. As I entered the store, I noticed that I had caught the eye of a middle-age man at the far end of the checkout stands. As I walked toward the shopping carts, he left his wife at the stand to walk toward me. There was a seasonal display to my right (Valentine's Day already?!? ), which I diverted my attention toward, so as not to have to confront this man. He stopped, though, right in front of the carts, so I was forced to face him after a few awkward seconds. He looked me straight in the eye, and in a slow and deliberate manner said, "M'am-You-are-(uh-oh, I thought; here it comes)-a-very---MONUMENTAL WOMAN." Since I'd never heard that one before, I was a bit taken aback, and I'm sure that my cheeks turned a color far beyond pastel. "Monumental, well thank you (I think)," I sheepishly answered. As he walked away toward the door, his wife was passing me with her groceries. She was much shorter than her six-foot husband, and so even much more short than I, and she looked up at me with the biggest smile on her face, telling me to have a wonderful day. I'm still not sure what the man meant by "monumental," but it was followed by "woman," and that's good enough for me! At any rate, I've decided that the weather should not have to dictate what I wear, necessarily, and that it feels good to climb out of the rut once in a while. Changing up our wardrobe choices is one of the privileges we women have; something we may often forget in our day-to-day lives. We do have the power to brighten our own day!